Monday, December 10, 2012 ratings — New episodes: The Voice, How I Met Your Mother, 90210, 2 Broke Girls, Gossip Girl, Hawaii Five-0, and Take It All. Specials: Extreme Makeover: Home Edition, American Country Awards, and Michael Buble: Home For The Holidays. Repeats: The Big Bang Theory and Castle. 8pm – Extreme Makeover: Home Edition: 1.3 rating with 5.2 million. 9pm – Extreme Makeover: Home Edition: 1.5 rating with 5.7 million. 10pm – Castle: (repeat) 1.3 rating with 5.9 million. 8pm – How I Met Your Mother: 3.3 in the demo (+7% change) with 9.1 million. 8:30pm – The Big Bang Theory: (repeat) 3.3 rating with 10.4 million. 9pm – 2 Broke Girls: 4.0 in the demo (+14% change) with 11.8 million. 9:30pm – 2 Broke Girls: 3.9 in the demo (-3% change) with 11.5 million. 10pm – Hawaii Five-0: 2.7 in the demo (+17% change) with 10.4 million. 8pm – 90210: 0.6 in the demo (+20% change) with 1.2 million. 9pm – Gossip Girl: 0.5 in the demo (+67% change) with 1.0 million. 8pm – American Country Awards: (special) 1.4 rating with 5.1 million. 8pm – The Voice: 3.8 in the demo (-3% change) with 12.2 million. 9pm – Take It All: 2.2 rating with 7.2 million. 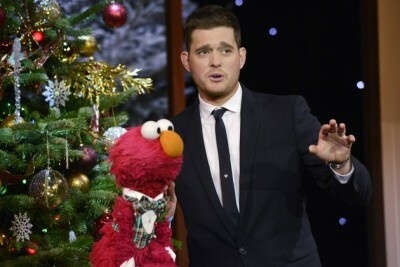 10pm – Michael Buble: Home for the Holidays: 1.4 rating with 5.8 million. What were you watching last night? What do you think of Take It All? Any other observations about the evening’s ratings? Texans-Patriots game a 10.4 rating and 14,483,000 million viewers easily won the night. It skews the results not to note this. I always watch Hawaii Five-0!!!! My favorite show. Without Revolution and with Castle as a repeat, it seems that Hawaii Five-0 got a little boost in the ratings, which is nice.